We were so lucky when our oldest was born. My husband and I were in rabbinical school and we were in a large community of students and friends. Most of our friends were young-marrieds, singles, and almost no one had kids. We were among the first. Definitely having a baby is hard. The first one is a total shocker. Life changes. Those first few months, that first year are a killer. David was born in November. I wrote and handed in my thesis proposal between his birth and January. I handed in my completed rabbinic thesis three months after his first birthday. We rarely went out at night but we had a great co-op daycare center on campus. Our weekly poker game continued, almost uninterrupted by David's birth, at our house. We put him to bed at 7pm. Poker started at 7:30. Some nights we had as many as 25 people in our house. The baby slept on upstairs, unaware. Today someone reminded me of all that. She has her first child now, almost one year old. It's been, as it is for all of us, a rough first year. They regularly speak about us, she says, and how we made it "look easy." We should have offered to help you out more, she told me, if only we had realized how hard it really was! And yes, it was hard. But I have to say, I can't imagine doing it any other way. I'm so glad we "hit the ground running" as my husband likes to say, by having a baby before we were out in the "real world." We were so lucky. Our child was passed from future rabbi to future rabbi...all the time. These people are my best friends in the world, they are my family. They were the ones who visited me in the hospital as I labored. (Imagine...the hospital was next-door to our school. At lunchtime, I had a full room of friendly visitors as labor progressed....can you believe it!?) I wish we'd all had our kids together. I wish I could have held their babies in their newness. Now they're all out there, having their babies, spread all around the country. I wish I were with each one of them, sharing their experiences as they shared mine. I love my life. But sometimes I miss my friends and their babies. Welcome to the world, Hazel Zahara. I wish I was there to kiss your beautiful little head. Did you know that you can skateboard on grass? And on your belly? That is, if you're 6 and 2 years old. This was one of those parenting moments when I couldn't think of a good reason to say no, even though that was my gut reaction. So...I said yes. And then I went for the camera, because they had so much fun. Haveil Havalim is up at FrumeSarah's place. It was worth waiting for!!!! Go check it out for the best of the Jewish and Israeli Blogosphere. and this spotting on the leaves? FrumeSarah is hosting Haveil Havalim. I'm waiting patiently for it to show up. Did you know you can re-arrange your blog list in Google Reader? Is this a new thing? Or have I been clueless. I hated how they started out in alphabetical order but somehow got all messed up. Now I have folders. Life is good. What feed reader do you use? How many feeds do you read? I have 229 subscriptions. Luckily they don't all post every day! I have been hard at work on the PTA newsletter. Hopefully it will be done this week and then I can show you where my creative energies have been going over the last week or so. We are moved back into our newly renovated synagogue building. I can't quite believe it, I still wander around and I'm so happy to have all my books (which have been in storage) back with me. I missed their cute little bookie faces. Have you ever lived through a renovation? Ugh. Do you ever go back and read your old blog posts? I was just looking for something to link to in this very random post that I'm reading. I think I need to go back and read some...and then share with you my favorite posts. I'm making a list of posts for the next few weeks. Time to get organized, serious, and into High Holy Day mode. I had better line up the blog plan...Elul, here we come! How do you get ready for the High Holy Days? Anyone else out there thinking about the first of Tishrei already? There was a whole piece on NPR this morning (on the way to Torah Study) about the liberal blogosphere. Did you know that is a real word? I kinda thought we made it up out here in blogland. Even cooler is the J-Blogosphere, which has its own Wikipedia entry. And of course, a convention, which I can't quite get to in person. Are you going? Wait, don't answer that. I don't want to be jealous of you. Okay, answer. I want to know. Even if I'm going to be jealous. you can make baked potatoes in your crock-pot!? who knew. Last week things looked up. Daughters got a few land rights. Men must hold the vows they make. Not the same for girls. if the men say so. Read other Torah thoughts here. I'm afraid to say that I got this email about Jewels of Elul. Why am I afraid? Because it does seem that people regularly like to point out how "soon" the High Holy Days are. As if the date isn't seared into my brain. I'm a rabbi, for goodness sakes! The High Holy Days are like the World Series, the Olympics, the Jeopardy Finals, all rolled into one big spiritual package. Especially for a rabbi. It's a pretty great thing - each day someone posts their thoughts on the Hebrew month of Elul, which leads into the holidays. You can click on the above graphic to sign up for your own emails from the Jewels of Elul. Hard to believe it's time, isn't it? And it's not even August yet! So, here are some of the summertime fun pictures I took this week! Go check out Haveil Havalim this week. who will inherit the land? but we want to inherit!" and brought their pleas before God. Read more about this week's Torah portion here. P.S. Today is Yom RJ.org (yom = day) so make sure to check out the Reform Blog today. Here's what the JTA Telegraph had to say. And Esther too. This headline at Jewlicious says a lot about it. Even the funny one isn't funny today. FrumeSarah is still hoping. People are really furious about this. Things like this make me really sick. And I am too. I just don't know what to think or say or do. *This is the traditional words that Jews say when hearing of a death. Yes, I know I haven't posted lately. And yes, I know that I haven't wrapped up camp. And there were super-tiny pepper buds but now there's this really long pepper! I'm already planning next year's garden. Maybe we should eat some tomatoes first. A Man, A Plan, A Donkey? God said "don't curse them"
God told him "go on." "Go on, but say what I tell." he had to bless them. 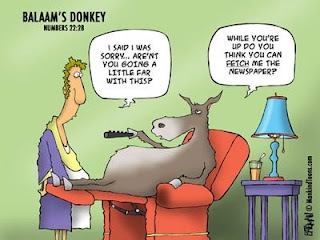 Moral of the story: Always listen when your donkey speaks to you. So here we are in good old Oconomowoc, Wisconsin, working and enjoying the life at Jewish summer camp. While I'm working on being one of the rabbis for the 140 campers in my unit, I'm also shepherding my family through the camp experience as well! Because, of course, we bring up the whole family. My husband is having a great time enjoying the company of the other faculty and the kids are enjoying the outdoor time and the freedom to run around all day long. AND Juggling Frogs is back! I'm so excited. bring back a pure state. That's where Miriam fell dead. and the people moaned and whined. the rock for water, nicely. But Mo hit the rock. "You did not have faith!" God was angry with them both. Why Send Your Kids to Jewish Summer Camp? While here at OSRUI, I definitely think a lot about the choices that parents make when they decide to send their kids to this camp versus any other summer camp experience. We rabbis spend a lot of time discussing recruitment strategies, how to encourage our parents to send their kids here, and bemoaning the fact that we can't get more kids to join us here at our favorite summer spot. To me, of course, it's a no-brainer. Summer is the time to connect with Jewish life. With the incredible opportunity to expand our Jewish horizons so accessible, I can't imagine how my kids would NOT go to Jewish summer camp. It's a chance for them to meet other Jewish kids from all over. It's a chance for them to see that Judaism is not limited to their home synagogue or even to their home! It's a chance to learn in a totally informal environment about the joys of living a Jewish life. It's a chance for them to see amazing Jewish role models in the staff who work so closely with each of our campers. It's a chance to gain a sense of independence about their Jewish identity, realizing that they can "do Jewish" without the direct impetus of their parents. And that they can control that Jewish activity in some way. Why NOT send your kids to Jewish camp??? ?